20 years ago to the day, the Rangers won Game 7 in double OT against the Devils to advance to the Stanley Cup Finals. How fitting is it that on May 27, 2014, they can win the Eastern Conference with a victory over the Canadians. There’s a great write up in the Post today about that wild Game 7 and how we should be celebrating more than just the Matteau goal. I was only five years old so it’s hard to remember the specifics of the whole game, but the game had a little of everything. 1994 was a very special year at the Garden and 2014 could be shaping up to be just as memorable. There haven’t been any guarantees but there have been dramatic finishes, compelling off-ice storylines and most importantly signature Garden moments the likes of which Ranger fans have been craving since ’94. Closing the series out tonight gives New York some much needed rest heading into a match up with likely the Kings (but maybe the Blackhawks if they can rally). Either will be a tough opponent but when the Rangers win cups, they do it in tense, nail-biting fashion. I don’t expect 2014 to be any different. As an aside, what a call by Howie Rose on Matteau’s goal. Like other great calls in sports history, it was not scripted. Just a spur of the moment description of events and the only thing that needed to be said after he scored an unlikely goal from behind the net is “Matteau.” Just like Al Michaels’ “Do you believe in miracles” and Vin Scully’s “29,000 people and a million butterflies,” it is a perfect call for the moment. It would take days to write out and plan such a distinct call and Howie nailed it on the spot. The moment was huge in it’s own right but the goal is even more memorable because of the call and that’s the ultimate compliment for a sportscaster. Can’t wait for Game 5 tonight. The Rangers are in the driver’s seat to play for the Cup and if I know anything about New York, those Stanley Cup games at The Garden are going to be electric. Like Alex said, this was the best tournament in the history of the show. Three of the all-time best players competing in a 2-day final after just beating other great champions from the past three decades. The $1 million game also featured the show’s winningest contestant in terms of overall prize money in Brad, record holder for most consecutive games won in Ken, and the record holder for most money won in a single game in Roger. The categories were almost impossible, which is fitting for three of the best to ever play. This behind the scenes video of contestant and family reactions during Final Jeopardy is fascinating. From Colby and the others confirming their correct answers to the shock of Brad’s $0 wager, to the utter shock of Ken’s incorrect response. Finally the dichotomy of the two families as Brad earned another million and Ken falls short on a question that I’m sure will haunt him for years. I really enjoyed this tournament and the finals delivered with the winner being decided on the Day 2 Final Jeopardy. The only way it could have been even better is if Roger answered just one of his $10,000 daily doubles correctly. He could have won it all given that he answered the final clue correctly – something that I’m sure he won’t forget for sometime either. I usually tune into Jeopardy to play along and see how many clues I can answer, but during this tournament I was much more interested in just watching great players. Hopefully the producers can think up another tournament that allows for all of those players to return. If nothing else, we should at least be treated to another match up between Brad, Ken and Roger. She did such an amazing arrangement that kept the soul of the song but made it her own. According to Howard, Billy watched on in amazement as Melissa interpreted one of his most famous songs. I didn’t know much about Melissa Etheridge or her music before this town hall performance but she blew me away and I’ve listened to her rendition hundreds of times since. Thank you Howard and Billy for putting together such a memorable show and thanks to Melissa for delivering the performance of the day. We’re more than month into the season and the Mets are over .500. The entire NL East is separated by just 1.5 games with the Braves in 1st and Miami and Philly tied for last. New York starts a 3-game series in Miami tonight with Niese taking the mound. 16-14 is much better than I expected through the first 30 games of 2014. Last year, we were never within 5 games of the division lead after April, so playing above average baseball for a month to start a season is a welcome sight. It’s interesting to see where the production for this team has come so far. Juan Lagares is hitting .338 and he’s currently riding a 13-game hit streak. In fact, he’s hit safely in 16 of his 17 games played this season. 9 of his 24 hits have also gone for extra bases – unexpected and welcome production. Daniel Murphy continues to produce, hitting .314 with 9 extra-base hits and 10 RBI. Murph has been a consistent hitter for a couple of seasons now and he has developed into a steady left-handed bat in the lineup. He’s hot coming into the Marlins series too, racking up 7 hits in his last 15 AB in Colorado. After trading away Ike Davis, Duda has taken nicely to his role of everyday first baseman – hitting safely in 10 of his last 11 starts. 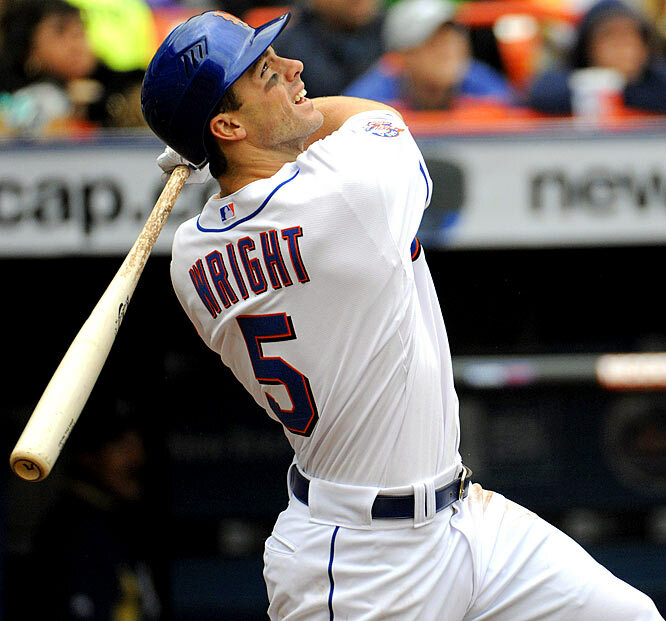 Wright is heating up with 6 hits in his last 14 at bats including 2 doubles. Chris Young has hit safely in 6 straight games too – going 9-for-22 during that span. Granderson has started slow but as long as he provides some power throughout the course of the season, he’s still a necessary asset in the lineup. As a team, the Mets rank at the bottom of most offensive categories. We are hitting just .230 as a team (28th in MLB), and slugging a pretty terrible .336 (29th in MLB). Our team on-base percentage of .309 ranks 21st, but our 128 runs on the season is the league average (ranking 15th). Despite all of these numbers, which I hope will improve as the season progresses, we are two games above .500. Terry Collins has his starting pitchers to thank for that. The rotation has racked up 19 quality starts on the season, good for 6th most in the majors. Our team pitching numbers are not fantastic but our bullpen hasn’t done us any favors in that regard. Saturday’s loss to Colorado was especially frustrating as Kyle Farnsworth allowed a 2-run, walk-off homer in a back and forth game. Starter Jenrry Meijia did allow 8 earned runs in less than 5 innings, so it’s just the best example, but the offense got the lead back for Farnsworth to earn the save, which he couldn’t do. If the starters can stay solid like they were in April, I’m optimistic that the bullpen can improve and help lockdown close wins. We are still trying to figure out how to deal with the loss of Parnell for the season and once everyone’s roles are clearly defined, I expect to see a more consistent overall performance from the pen. It’s very early in the season – there are still 5 full months of baseball to play before the postseason. But that fact doesn’t hamper my enthusiasm for what we have accomplished and what this season can become. Like every other Mets fan, I’m clamoring for the days of 2006, when we were a threat to win it all. 7 straight seasons of disappointment and mediocrity has taken its toll. I’m ready to get behind a team that has the potential to win in October. Before the first pitch this year, I thought we were still a year away but maybe I was wrong. Maybe, this team is capable of going on a run. 2 games over .500 is not spectacular and maybe it’s a little pathetic that I’m this excited over a 16-14 record, but I can’t help myself. We’re one game out of the division and the Braves have lost 6 straight. We’ve got to take at least 2 out of 3 from the Marlins and continue on this upward trajectory. If nothing else, just give me meaningful baseball to watch after the All-Star break.